Catalog of a traveling exhibit: 11 1/2 x 10 1/2", 68 pages, 43 color reproductions, with essays by Rudolf Arnheim, Alex Barker, Tom Healy and an interview with Lynn F. Jacobs on the triptych form in the fine arts. Available: $ 25 (includes shipping and handling). A dramatic traveling exhibit of 15 works, The Lasting World: Simon Dinnerstein and The Fulbright Triptych, is the theme of the new publication. 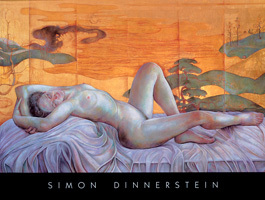 The title The Lasting World comes from an essay on Simon Dinnerstein by the noted art theorist and psychologist, Rudolf Arnheim. The publication includes an interview with distinguished art historian Lynn F. Jacobs on the triptych form and essays by Alex Barker, Director of the Museum of Art and Archaeology, Univervsity of Missouri-Columbia and Tom Healy, who served three terms as Chairman of the Fulbright Foreign Scholarship Board, which oversees the worldwide Fulbright Program. Granted a Fulbright Fellowship in 1970-1971, Dinnerstein traveled to Germany where he began working on The Fulbright Triptych, his best know work. The triptych, which measures 14 feet in width, has been the subject of much critical response, including reviews by Roberta Smith and John Russell, both senior art critics for The New York Time. The following starred review by Roberta Smith, Senior Art Critic for The New YorkTimes, appeared in The Times' Art Reviews of August 11, 2011, Ms. Smith ends her review with a suggestion for the Metriopolitan Museum of Art to carve out a place in their schedule for an exhibit of the Triptych. A version of this review appeared in The Times' Art Listings for 100 weeks between 2011-2014. 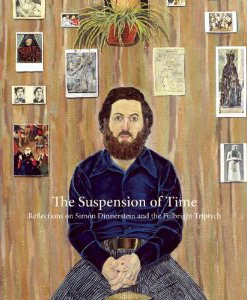 "This little known masterpiece of 1970's realism was begun by the young Simon Dinnerstein during a Fulbright fellowship in Germany in 1971 and completed in his hometown, Brooklyn, three years later. Incorporating carefully rendered art postcards, children's drawings and personal memorabilia; a formidable worktable laid out with printmaking tools and outdoor views; and the artist and family, it synthesizes portrait, still life, interior and landscape and rummages through visual culture while sampling a dazzling range of textures and representational styles. It should be seen by anyone interested in the history of recent art and its oversights." This 360-page anthology features over 40 essays (accompanied by 70 illustrations, 59 in color) in which novelists, poets, composers, musicians, art historians, art critics, actors, and others offer their unique perspectives on the artist's monumental painting, The Fulbright Triptych. Among the contributors reflecting on the Triptych—a collage-like composite of family portrait, still life and landscape, as well as a meditation on the creation of art--are Jhumpa Lahiri, Anthony Doerr, John Russell, Colin Eisler, George Tooker, Thomas Messer, and George Crumb. 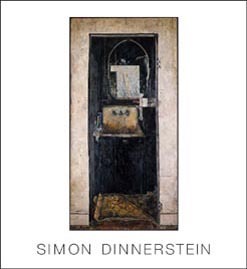 "Simon Dinnerstein's Fulbright Triptych is one of those singular and astonishing works of art which seem to imply a description of the whole world merely by insisting on a scrupulous gaze at one perfect instant. It functions as a time capsule and a mirror for its viewers souls, and so despite personal and historical referential elements has become permanently contemporary and universal. No surprise that it has now served as a point of instigation for a cycle of astonishing written responses; this book is like tuning the painting in like a radio to a station where these responses were always already playing." This 126-page compendium of the artist’s work features 81 color plates (including 3 gatefolds) and 20 black-and-white reproductions. 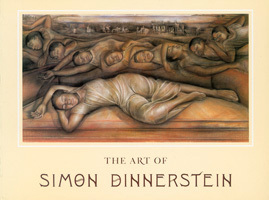 Of particular Interest for students and art connoisseurs are the brief, informative essays by Guy Davenport (The Art of Simon Dinnerstein); Miller Williams (Coming To Know Simon Dinnerstein: The Art and the Artist); John Russell (In Dinnerstein’s Painting, an Echo Chamber); Robert L. McGrath (To See and Be Seen: The Fulbright Triptych of Simon Dinnerstein); Rudolf Arnheim (Pictures of the Lasting World); and Edward J. Sullivan (The Urban View in the Art of Simon Dinnerstein). This 288 page monograph features 99 color plates and 49 black-and-white reproductions. The book includes a foreword by Thomas M. Messer, an epigraph by George Tooker, and an introduction by Albert Boime.